Haimark Ltd., an ambitious travel start-up, is on the verge of a major expansion in the river and ocean-going cruise markets. It will introduce two Asia river ships in September and another one in January — and then will enter the ocean cruise market in May. Plus, more river ships are on the way after that. Haven’t heard of Haimark? The company was founded in 2013 by three veteran travel executives. Before that, Marcus Leskovar was president and Tom Markwell vice president of sales and marketing for the North American operation for Pandaw, an Asia river cruise company headquartered in Singapore. When that operation closed, they formed Haimark Ltd. as a destination management company and now are managing partners, with Leskovar handling finance and procurement from the Denver area and Markwell overseeing sales and marketing from Illinois. Hai Giang is the Vietnam-based managing partner for operations. Now the company is gearing up for a major expansion in its Haimark Line cruise division. It will introduce the 56-passenger Irrawaddy Explorer on Sept. 3 in Myanmar and the 68-guest Mekong Navigator on Sept. 7 to operate in Vietnam and Cambodia. 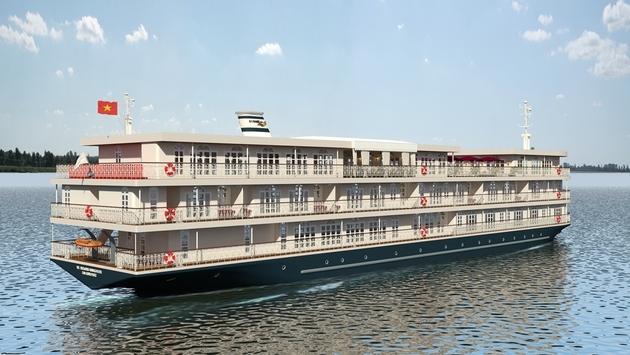 Then, on Jan. 3, Haimark will launch river cruising in India, with the 56-passenger Ganges Voyager. It will operate seven-night round-trips from Kolkata, India, and offers land extensions to Delhi and Varanasi and/or the Golden Triangle of Jaipur, Agra, and Delhi. A second vessel, the Ganges Voyager II, is scheduled to enter service on Jan. 6, 2016. On Sept. 10, 2015, Haimark will launch a 24-guest, all-suite, “spa concept” ship named Mekong Princess. The company says it will have “the most extensive spa menu of any ship on the Mekong River” with several types of massages, facials, scrubs, and body wraps. Each guest will receive one free hour-long spa treatment during the cruise to begin the week-long rejuvenation. So that summarizes the river cruise expansion. The company now is expanding to the oceans, primarily the North Atlantic coast, the Great Lakes, the St. Lawrence Seaway, and South and Central America. It negotiated a five-year lease for the 200-passenger Sea Voyager from FleetPro, a company that manages ocean and river passenger vessels worldwide. Haimark will invest $3.5 million primarily on soft goods and furnishings for the ship, which was built in 2001 and will be renamed Saint Laurent when it re-enters service. It was laid up for several years, used as an accommodations vessel at times, but was in great condition, Markwell said. So now the renovation is replacing soft goods, carpeting, upholstery, glassware, deck furniture and the like. The Saint Laurent’s itineraries include the 10-day “Canada’s Atlantic Coast and the St. Lawrence Seaway”; the 10-day “The Five Great Lakes — A Freshwater Paradise” and the 10-day “Georgian Bay and The Five Great Lakes.” In addition, the 13-day, “Historic Coastal America” traverses the entire Atlantic Seaboard and will visit many historic ports on its way south in the winter. In South and Central America, the routes include travel from Nassau to Cartagena, Colombia, then Cartagena to San Jose, Costa Rica, and from San Jose to Lima, Peru. Highlights include daytime transits of the Panama Canal, and UNESCO World Heritage Sites Coiba Island and The Darian Jungle. These cruises will feature an expedition team and a fleet of new Zodiac rafts. “We are extremely proud to unveil our first ocean-going vessel and have already sold 50 percent of the 2015 departures,” Markwell said. For more information on this company, call 855-HAIMARK.